I heart food but I don't eat that much compared to when I was in college but regardless I have a few dining places where I love their dishes and some that I'm hoping to try just by reading the reviews about them. 1. Spiral Restaurant - I've never tried eating here yet but I heard a lot of good reviews. They are pretty famous with their international buffet that everyone has been raving about. 2. Chilli's - at first the name deceived me. I'm not a big fan of spicy foods but I so love the dishes that we ordered the last time that we were here with my friends. Of course my food is anything but chili. 3. Hawaiian BBQ Restaurant - this is where Hubby and I dined last year on my birthday :) I love their Hawaiian baby back ribs! Yum!Yum! 4. 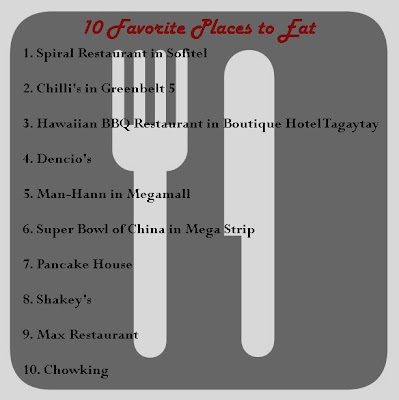 Dencio's - what I love is their Pork Sisig! It is the best! 5. Man-Hann - I loved this restaurant when I was working in Ortigas area. Dishes are good for 2 or more people thus it's affordable and i loved their fried rice. 6. Super Bowl of China - their siomai is one of the best! 7. Pancake House - nothing beats their pancakes. 8. Shakey's - Uber love the mojos! 9. Max Restaurant - they are good in Filipino dishes and their chicken is simple mouth watering. 10. Chowking - a simple fast-food chain but I'm used to the taste of their Chinese dishes. Surprisingly, I like their siopao compared to Henlin. ohh.. i love your list. my list should be more than 10 hehe! Great list! The Hawaiian ribs sound delicious! Have a great day!